Details: I was hired by StudyDog to help create a Flash-based reading program for struggling readers. The Creative Director and I created a game-like environment to teach reading. 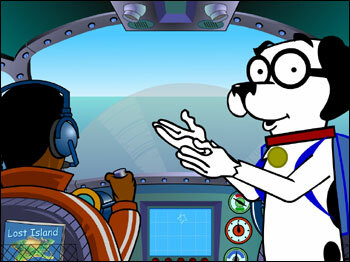 The result: Lost Island, a place where you and StudyDog visit to help the world famous Dr. Z on her adventures. Each lesson started with an animation that had to remind you of the over arcing story, explain the current goal, introduce new characters and make you laugh. In addition, all of the interactive behaviors had to be spec’d out in painstaking detail for contractors. I was responsible for the majority of the script and spec writing. This is the script for the course intro. It's purpose was to establish the story while downloading the course to the student's computer. Camera iris out. You are looking out the windshield of an airplane out onto the ocean. You hear a small plane engine and see a propeller whirring. There is a pilot in the left chair. On the dash is a blue video screen. The screen begins to show static and an image begins to appear. You tilt down and zoom in to a shot of the screen showing a little bit of the surrounding dash. Dr. Z is on the screen against the blue background. The small plane engine sound lowers in level or completely disappears. Cut to video screen full frame. Cut to showing the complete map being tore apart and scattered off screen. Cut back to Dr. Z.
Dr. Z fades to black as coins start to fill in across screen. The score flies up from the nav bar and starts adding up. Score adding up finishes with visual effect, loud bells etc. Cut to Dr. Z. Cut to StudyDog. The small plane engine sound resumes original volume. Cut to opening shot. Lost Island isn’t visible yet. We tilt down and zoom in on screen again. This time there is a GPS-like animation of a little plane flying toward Lost Island. Muzak accompanies. Shot widens to show full dashboard, pilot in left chair, and ocean view out windshield again. Lost Island is now visible in the distance. It is the same star shape as in the transitions. StudyDog sticks his head in looking at you and gestures toward Lost Island. We zoom through window toward Lost Island. The small plane engine sound lowers in pitch and fades out. Camera iris in.